These moist, vanilla/orange-scented muffins, made with self-rising flour, are as pretty as they are tasty. Shredded zucchini and grated orange peel add flecks of lovely color. 37 mins. to 44 mins. Preheat the oven to 375°F. 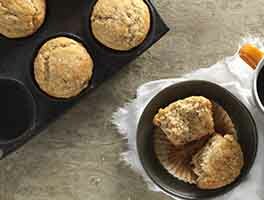 Line a 12-cup muffin pan with papers, and grease the papers; or grease each cup. Beat the sugar, oil, eggs, and vanilla till smooth and somewhat lightened in color, about 1 minute at high speed. Add the flour and baking soda, beating just until smooth. Stir in the shredded or grated zucchini, and the orange rind. Divide batter evenly among the prepared muffin cups, filling them about 3/4 full. 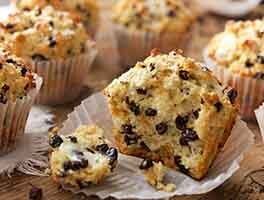 Bake the muffins for 25 to 27 minutes, or until a cake tester inserted into a muffin comes out clean. Remove them from the oven, and after a minute or so gently tilt them in the pans, so their bottoms don't become soggy. 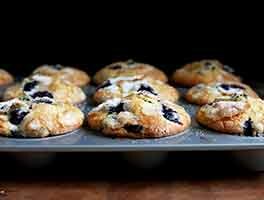 As soon as you can handle the muffins, transfer them to a rack to cool. 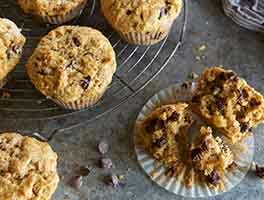 Store leftover muffins at room temperature, tightly wrapped, for several days. Freeze for longer storage. 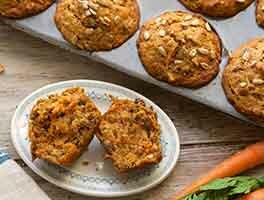 To make these muffins with all-purpose flour, reduce the amount of flour to 1 3/4 cups (7 1/4 ounces); add 1/2 teaspoon baking powder, and 1/2 teaspoon salt. Follow the remainder of the recipe as directed. Want to make mini muffins? Prepare the batter as directed, and scoop into a mini muffin pan, filling the cups about 3/4 full. Bake for about 15 minutes, until a cake tester or toothpick inserted into the center of one of the muffins comes out clean. Having found King Arthur recipes to be very reliable, I don't usual make changes. But I did. I added 1/8 tsp salt to boost the orange flavor and added 1 T of the fresh juice. The zucchini had average moisture content and Mexican Vanilla had the perfect intensity. My instinct was to lower the heat on my oven, but I didn't. So even though I baked them for 5 minutes under the recommended time, they were over done. But the flavor was wonderful and I will definitely be making these again. Nice alternative to the typical bread for using up the zucchini from the garden. I reviewed this recently and always enjoy but do find the moisture content different every time, and usually get 9 or 10 muffins, never more than that. I use all purpose flour, not self rising and add salt and baking powder. Two question about the recipe. Would the flour make a difference to the volume and after making it multiple times I realized adding baking soda was in step 2 and 3. Which should it be. I'll start by saying I bake muffins twice a week. I made no substitutions to the recipe, other than reducing the sugar by 1/4 cup. These made 11 muffins to the half-cup mark in the liners. No way they could have made 12. They were dry. I weighed the zucchini and other ingredients, as suggested in other reviews. This recipe needs something else to make it moist - yogurt, milk? Otherwise, it would be a nice-tasting recipe. I really liked these but I have two questions before making another batch. I substituted Truvia baking blend for the sugar and used unsweetened applesauce for the oil, other than that no changes until I tried to scoop it. The dough was SUPER thick so I added a little milk and also got only 10 muffins. My questions: Could I have used OJ instead of milk and is the dough supposed to be that thick or could that be from the Truvia and applesauce. Made this recipe many times and they are delicious! Everyone in my family loves them. I made the original recipe and that was good. But then, I changed it up a bit: I substituted 1 c drained, chopped mandarin oranges for the zucchini; and added 1 tsp. orange extract and 1/4 tsp. orange oil (what can I say, we like orange!) with the vanilla; added 1 tsp. lime juice powder with the dry ingredients; and added 3/4 cup of dried, chopped cranberries, folded into the batter at the end; and finally, topped it off with sparkling sugar. THOSE muffins were AMAZING!!! 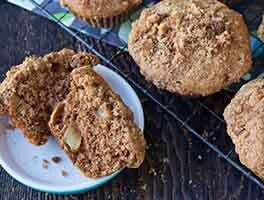 It was kind of a mash-up of the vegan clementine muffin recipe on this site (also very good!) and this recipe, but it's now a top-shelf recipe and it's SO hard to not just sit there and eat the whole batch! I found this recipe while looking for ideas to use up the end-of-summer zucchini that the kids will enjoy. These were very good--easy to make and almost tasted like cupcakes. I shredded the zucchini very fine so it was more like green specks in the muffins. The kids went back for seconds! Always looking for ways to use up some of our bountiful harvest of zucchini and came across this recipe. As other reviews have noted, these are moist, light and very delicious. Quick and easy to prepare, love the hint of orange flavor, huge success with family. Might even ramp it up a tad more with a bit of orange oil next time. I used fresh orange zest, then peeled the orange and diced up the sections. I omitted the vanilla and added the orange sections to the batter. I sprinkled raw sugar on top of the muffins before baking. I really liked the results.